You may remember Apple's eMate laptop. Swedish designer Thomas Meyerhoffer created it. 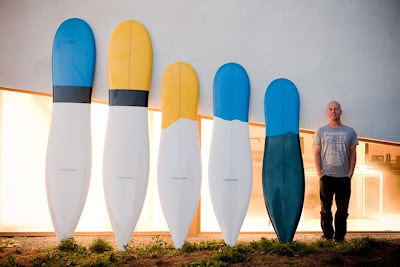 Now he designs surfboards. His hourglass shapes reduce mass in the middle of the board, supposedly making them lighter and more maneuverable. The drastically pulled-in tail and deep double-concave on the board's bottom allegedly improve speed and drive. The idea is that even the longer models perform like shorter boards.